Map of Cyprus Cities. Kyrenia, Famagusta, Nicosia, Limassol, Paphos, Larnaca, Ayia Napa map. 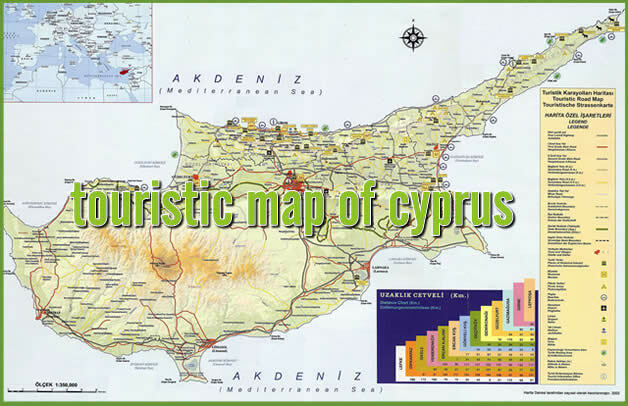 Include North Cyprus Map. North Cyprus Map, Cyprus is the third largest and most eastern island in the Mediterranean. Cyprus has an intense Mediterranean climate with hot dry summers and changeable winters. In the far eastern Mediterranean Sea, below Turkey and to the west of Syria, Cyprus is actually two countries – the Turkish Republic of Northern Cyprus (recognised only by Turkey) and the southern Republic of Cyprus. There are two large mountain ranges on the island: the Kyrenian Range in North Cyprus and the Troödos Massif in the centre of the Republic. The northern mountains are mainly limestone, the southern are volcanic rock. These ranges are separated by the Mesaoria Plain.